In the area Hand Made at northmodern there were two craft workshops sharing a large stand under the heading HANDMADE IN HUNDESTED. Hundested is a small harbour on the north-west coast of Zealand and in fact the workshops are neighbours on the quay. Nanna Backhaus Brown and Andrew Brown are glass makers producing a wide range of bowls, vases, decorative works and lamps in coloured glass. Their display included a workbench with their tools and films of the work process to show, in particular, how rods of coloured glass are used in gathers and then blown to form fine and intricate linear patterns in the final pieces. From the neighbouring workshop in Hundested - Egeværk Møbelsnedkerie - cabinet makers Lasse Kristensen and Mette Bentzen showed their work. Again there was a workbench and tools and again incredibly refined and beautifully finished examples of their work. One of the chairs, A Touch of Mac, was designed by Hannes Stephensen and made in the Egeværk workshop as a collaborative piece for the Petit - the Cabinetmakers’ Autumn Exhibition held at Øregaard Museum in September and October last year. 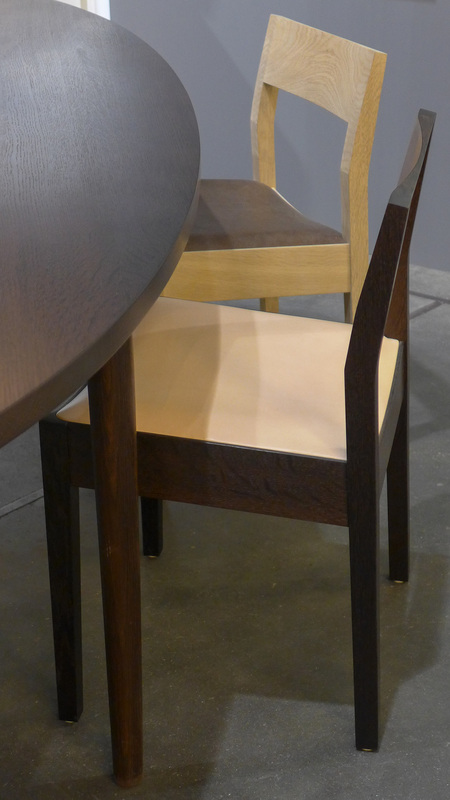 This is chair number two, the piece shown at Øregaard being now in Paris for the major annual event Maison & Objet. Other pieces showed their approach to adapting designs to the specific requirements of their customers helping them to choose appropriate timber and finish and able to customise the size of furniture or make specific pieces designed for a specific space. Both trained in the workshops of PP Møbler but are are now teaching their own apprentices with three currently attached to the workshop.